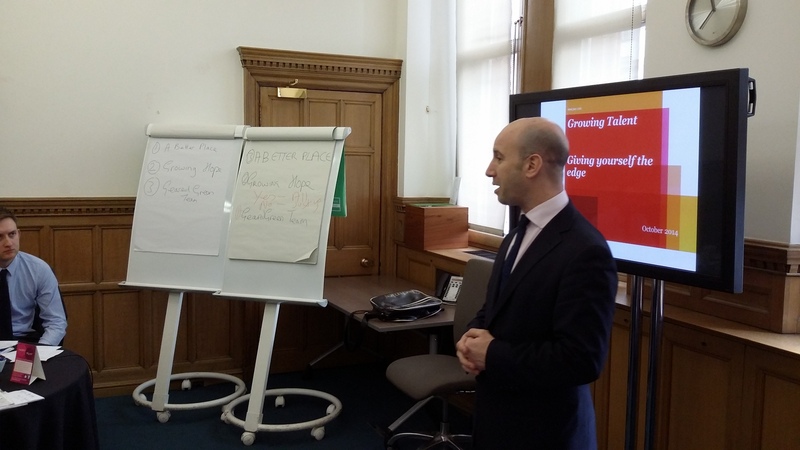 Today saw Ben return to present his ‘Give Yourself the Edge’ presentation to the Growing Talent Associates. With a strong focus on image, body language, perceptions of others , what is customer service and so on. Ben’s style of delivery made everyone relax and learn – although there was a sharp intake of breadth when Ben got his blindfolds out! A simple but effective way to illustrate people can tell if you are slouching, looking bored even when they can’t see you – eg over the telephone. Strange how everyone suddenly sat up straight! Ben shared an example of how a customer’s perception is their reality. He asked ‘how do you think I am today? am I calm? professional?’ everyone answer ‘yes’. Then Ben shared what’s really going on – a full diary, a presentation to over 50 people, back to back meetings – he’s a little ‘frazzled’ inside, but no one ever sees it. A great insight into how no matter what is only on in our lives, others depend on us to help them. It’s actually true. When we help others and give good service, we forget our own problems – even if only for a little while. Over lunch, Ben shared some more insights on a 1-2-1 level with the guys. Never ones to miss a networking opportunity, they secured Ben’s contact details – along with the challenge from Ben to find him on Linkedin – before letting him escape to his next meeting! This bespoke presentation gives the guys the tools to really have the edge!